Quatre chambres Deux Bath Brand New Accueil Walking Distance à Thunder Cove Beach. Bienvenue à Thunder Cove spectaculaire! Nous venons de construire cette nouvelle maison de quatre chambres et deux salles de bains. La maison est à cinq minutes à pied de la plage (parking privé sur la plage également) mais dispose d'un cadre paisible. Nous avons conçu cette maison avec une touche contemporaine. Le deuxième étage est une suite grande ouverte de la chambre de maître avec un lit queen, salle de bain avec douche et un coin salon. Sur le premier étage est une chambre d'angle avec une reine et un grand placard, une petite chambre avec un lit double et une chambre avec couchettes doubles. Le salon du premier étage est grande ouverte avec de grandes fenêtres tout autour. Nous avons deux grands canapés et d'une télévision à écran plat dans le salon. La salle à manger a une table qui peut accueillir 8-10. La cuisine est très bien aménagé, avec une grande île pour tous ces grands repas de famille. Hors de la salle à manger sont deux portes à notre immense terrasse de 600 pieds carrés avec barbecue, chaises et tables en bois Adirondack. Dehors, nous avons aussi une douche chaude et froide magnifiquement clos avec une promenade sur le pont. Nous sommes strictement une maison non fumeur et ne pouvons pas prendre de RV de toute nature. Nous ne pouvons pas avoir tout type de RV, camping-car, caravane ou camping-car de toute nature. Very well appointed, modern cottage a short walk from the beach. Chris was also very quick to respond to any questions we had, so I would definitely recommend this property and others from this owner. A word of advice to those like me who brought along their work with them, the internet / phone signal isn’t the best at this part of the island. But with such a beautiful beach and property, work can wait. PS. The outdoor hot and cold shower was a big hit coming back from the beach. This property is fabulous. It has all the necessities as well as the nice to haves. We had 6 people staying and the house met our needs. The roads were terrible, rutted and bumpy, so travelling to and away from the house was a challenge. However having said that we still loved the house and thoroughly enjoyed our vacation. Thanks for the nice review. The sub division is in the middle of repairing the roads. We’ve had a cold and wet spring and have had to wait for the weather to change before we can finish. Should be done soon. Great house, great location. Problems with the fridge but Chris replaced it the very next day!! 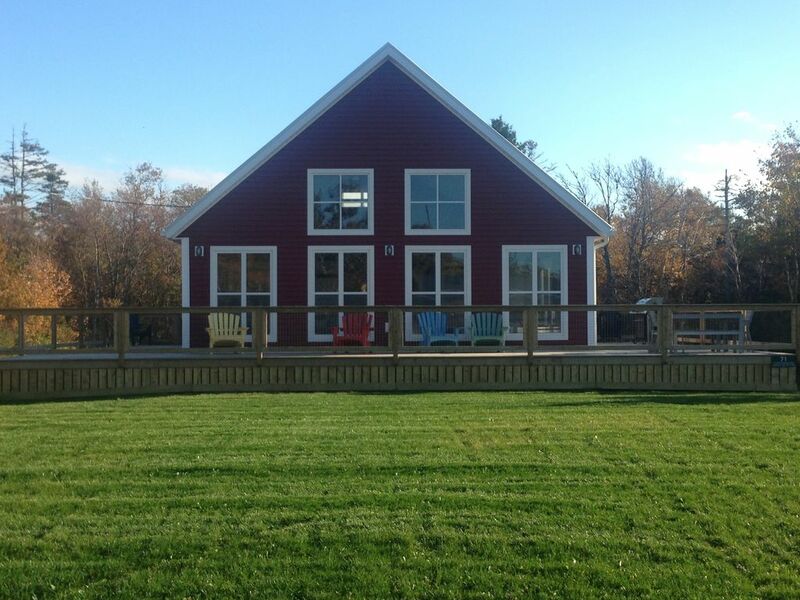 We stayed 4 days last week in this wonderful cozy yet spacious house in Thunder Cove. The layout and amenities were great--windows all around, nice washer and dryer, and lots of room in the kitchen and living area for 4 adults sharing cooking and hanging out activities. On our second day there, a substantial rain and windstorm blew in, and we lost power and water for a few hours. Chris was immediately available via text message and updated us with info from the power company and possible alternative lodging, but we huddled under blankets and read, and fortunately the outage didn't last too long. We then enjoyed watching a movie by accessing our online Netflix account (fortunately, one of our group was technologically savvy and knew how to do this, but this kind of information would be a helpful addition to the app). The app includes some helpful resources about the area, but surprisingly lacked info about grocery stores nearby--which would have been nice to have on our first night there. We enjoyed our stay very much and definitely recommend this house! We spent a lovely week in Thundercove. Chris was a very responsive host, who checked in immediately upon our arrival and responded to all our issues very promptly. We very much enjoyed the design of the house. It was a new home, and had lots of light. As another reviewer mentioned, the loft is not separated from the main living area, so this could be a problem for some, but worked well for us as we had 2 little toddlers staying downstairs and it made it easy to hear them. We really enjoyed the walk to the beach every day. With our stroller and 2 little ones, we were slow moving but did not take more than 8-10 minutes and was a nice walk. The beach was without a doubt one of the most beautiful of any I have seen! The house was as expected in the pictures. With that said, one of the pictures that I still see up on the website makes it look like the house is in the middle of an open field. This is not the case. The house is not remote. You have a direct view into the house across the road, and can easily see their TV at night for example. This was initially a disappointment as we were expecting a more remote experience, but we made it work. We appreciated the fire pit in the backyard. The kitchen was reasonably equipped, but with the basics (as another reviewer mentioned, no blender, wine opener was broken, no large coffee mugs, no salad spinner). Overall, it was a lovely vacation. Would definitely return to the area again, although ideally we would find a place even closer to the beach. This is a brand new house this year and we did forget a few things. The missing kitchen items will be bought and stocked this fall. The picture mentioned has been taken down. It was from one of other homes by mistake. Ce est-il arrêter de regarder! Plage de Thunder Cove est l'un des, sinon le plus belles plages de l'Île. Ceci est la plage préférée habitants qui dit tout. L'eau chaude, le sable mou, des dunes, des falaises rouges et du littoral, vous pouvez marcher sur des miles. Darnley est à environ 10 minutes de Kensington, 15 de Summerside et de 40 à Charlottetown. Il ya au moins une demi-douzaine de terrains de golf dans les 35 minutes de la maison. We are strictly a non smoking house. Guests are responsible for any smoke remediation costs of property. We cannot accept any type of camper, RV, motor home of any kind.